The Commissioner of Customs and Excise, Mr Hermes Tang, attended the 129th/130th Council Sessions of the World Customs Organization held in Brussels, Belgium today (July 6, Brussels time). 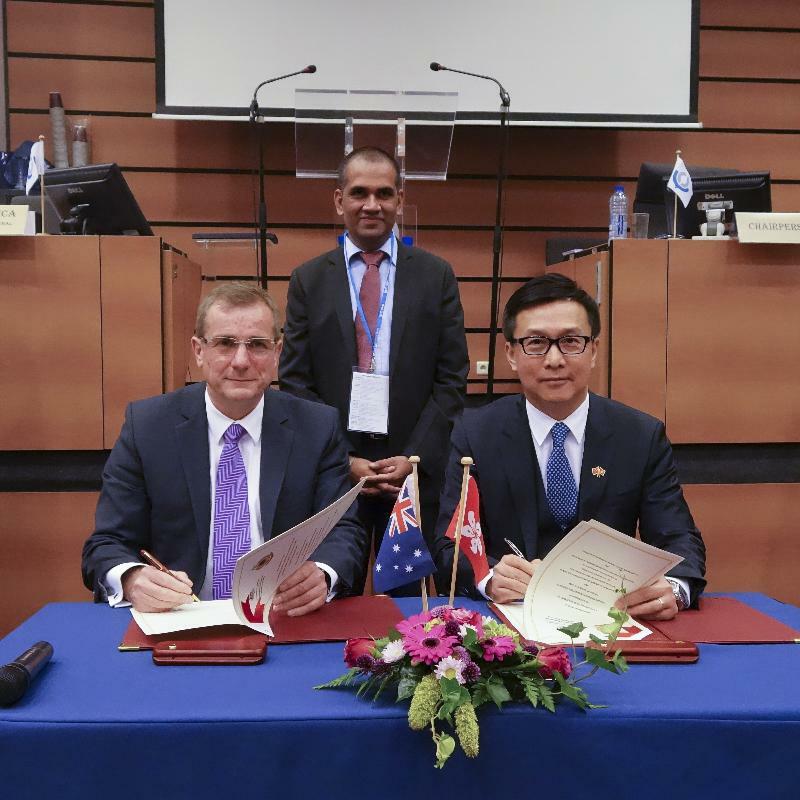 Mr Tang also signed the Mutual Recognition Arrangement (MRA) with the Acting Commissioner of the Australian Border Force, Department of Immigration and Border Protection, Mr Michael Outram. Under the MRA, the Hong Kong Authorized Economic Operator (HKAEO) Programme and the Australian Trusted Traders (ATT) Programme are mutually recognised. Trade facilitation benefits, including reduced examination and prioritised clearance as provided by Hong Kong Customs and Excise Department (C&ED) for the HKAEOs, will be extended to members of the ATT Programme accredited by the Australian Customs and vice versa. This is the eighth MRA that the C&ED has concluded with other Customs administrations after the ones with the Mainland, India, Korea, Singapore, Thailand, Malaysia and Japan. The MRA demonstrates the two Customs administrations' efforts in stepping up international cargo security while also providing trade facilitation for the economic prosperity of both economies. Meanwhile, MRA discussions with Mexico, the European Union and New Zealand are in the pipeline and good progress has been made. The C&ED has also been actively exploring the possibility of developing MRAs with the Belt and Road economies so that HKAEOs can become more competitive and better explore the markets in the region.